BMC TV, our brand new online video platform, has just gone live, bringing together exciting walking, climbing and mountain content and mixing it up with essential skills and safety advice. If you’re a member of a BMC affiliated student club, keep an eye out for your new membership card in the post, accompanied by great advice on improving skills, saving money, and staying informed. Save time and money by doing some Christmas shopping in the BMC online shop. We’ve got some great offers on books, maps, DVDs and 2014 calendars. 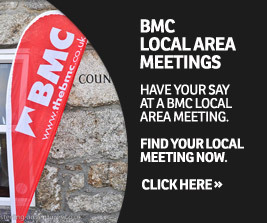 We have had a fantastic response to the BMC Hill Walking Survey, with more than 2,000 people taking the time to fill it in. Here is a snapshot of some of the feedback we gathered. The tragic death of 12-year-old Italian prodigy Tito Traversa made headlines around the world. The cause of the accident was the failure of incorrectly assembled quickdraws during a climbing trip to Orpierre in France, prompting the Italian prosecutor to begin investigating five different suspects. As Tito’s family mourn their loss, the circumstances of his death have prompted a wider debate about where responsibility for risk lies, as Ed Douglas reports. In one of the most audacious, yet perfectly executed, climbs in recent years, Ueli Steck has soloed a new route on the south face of Annapurna. Are you a would-be winter warrior? Don't miss the BMC winter skills lectures this November/December: the ideal way to get set for the season. Save time and money by doing some Christmas shopping in the BMC online shop.